Bell Creek is located in Canada, 20km NE of Timmins. Bell Creek is considered to be an orogenic gold deposit. Bell Creek is an underground operation, employing long hole stoping technology. Bell Creek is 100.00% owned by Lake Shore Gold. Lake Shore Gold (TSX:LSG) is up 4.21% to 99 cents a share after announcing a 29% increase in its ore reserves today at its Timmins West and Bell Creek operations. The northern Ontario miner says total reserves are now 773,300 ounces, up from 598,800 ounces a year ago. A total of 122,000 metres of drilling was completed in 2014 at Timmins West and Bell Creek largely focused on converting resources to reserves. Following the new reserve update, the Company continues to have a large resource base to support future additions to reserves, and also has numerous opportunities to grow resources through drilling for extensions at the existing operations and for new discoveries. 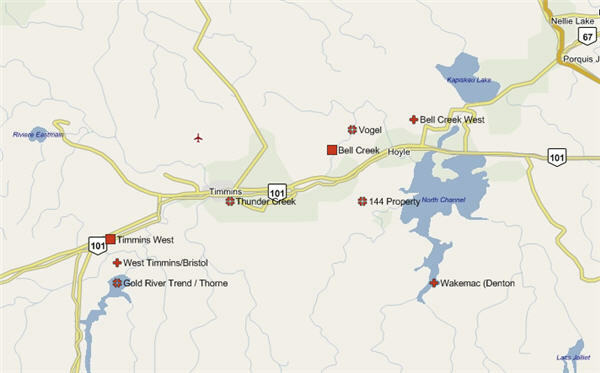 In 2014, exploration drilling to the southwest of Timmins West Mine resulted in an important new discovery within 500 metres of Thunder Creek. The 144 Gap Zone is a large zone covering 350 metres along strike and 350 metres down dip, which remains open for expansion. Tony Makuch, President and CEO of Lake Shore Gold, commented: "The primary objective of drilling at both Timmins West Mine and Bell Creek Mine in 2014 was upgrading resource classifications and converting resources to reserves. We surpassed our goal of replacing reserves mined in the year by doubling total reserves at Bell Creek and adding to our reserves at Timmins West Mine. In 2015, our goals are to replace reserves mined during the year as well as increase our overall resource base to drive further reserve expansion. The 144 Gap discovery is the focus of our exploration program in 2015 with our target being to establish a first resource for the end of the year. Moving forward, our key priorities remain to consistently achieve safe and efficient operations, generate significant free cash flow, replace the reserves we mine and build resources in support of long-life production and long-term value creation. The company's 52-week range is 68 cents to $1.40. Lake Shore Gold is listed at the TSX and has a market capitalization of USD$316.63 million. Lake Shore Gold has two active mines and 24 exploration projects in one country. Of those it controls two mines and 11 exploration projects. Its assets are located in Canada.